The description is enough to let us have a fair idea and image of the regular turns and tricks through which another tale of a ‘Hero’ or a ‘Saviour’ (a Messiah and a prophet even) will emerge triumphant (Almost like sci-fi during cold war times when Hollywood took it upon itself to be the foot soldier of US imperialism, and which continued even after the end of the cold war: but that is a different matter). Tales told, scores settled, and everyone happily retiring into the smug confidence typical of bourgeois societies that ‘all is right with the world’. Yes and no. that is the feeling one gets watching ‘Exodus’- confirming some suspicions, and arousing more questions about epic films and the utopian visions they set. One cannot help noticing a steady change that has undergone the epic film as a category over the past few years. It is this change in terms of narrative, relation to present and questions they attempt to address over the link between art, life and utopia which I would like to explore here. While doing this, I will try to contextualize the broader themes and arguments around ‘Exodus’; the themes and arguments being grounded firmly in the understanding that art (and films as a characteristic ‘modern’ art) function as a terrain of class struggle. If we are to gain any meaningful understanding and appreciation of art forms and its contents, there’s no substitute to larger social dynamic which is decisively political in the end- the politics being that of class. The ambivalence, dislike towards mention of politics in the context of the arts has been a surest sign of class positions. Hiding behind euphoric slogans of the consumerist global capitalist world which has transcended class, or problematising the world into disjoint autonomous structures with little bearing on one another- both point to the same aversion. Be that as it may. My limited point is: when we confront terms like ‘Hero’, ‘villain’ along with a ‘chorus’ (conspicuous by its silence) and battles being fought to ‘free a people’- we simply cannot ignore politics, and thus class. The war cries may seem distant and alien, but the war persists. What shapes it takes while operating in consumer society of today, how an audience-protagonist/ hero relation evolves, what utopian vision it carries, and how the audience receives it; we shall see. Epic film as a genre is well-established with a fairly diverse set of movies, even in the recent past such as ‘300’, ‘Gladiator’, ‘Troy’, and ‘Avatar’ catering to a large global audience. Epic films have become a Hollywood canon and a safe bet to commercial success. However, what stands out in favor of films like Exodus, Avatar is the manner in which they attempt to transcend the lines and plots handed down by myths, (or hark their way back into ‘mythical golden age of communities’ as Avatar does) while raising a fundamental question concerning the structure of human society. At the same time, it is necessary to bear in mind that these are ‘epic’ films, i.e. epic as an art form, witnessing a meta-articulation through a thoroughly modern and technically more sophisticated art form i.e. films. Hence, the popularity or public interest is combined both for modern rendering of visual effects and hyper-real images of mythical powers as well as the myths themselves. The latter point about the popularity of myths is extremely crucial in that it is organically linked to the rise of fundamentalism, communalism over the past century. Films, paintings, novels have almost become the battlefields where any attempt by artists to have a portrayal not conforming the notion of communalists and their designs faces their wrath. The trouble over ‘passion of Christ’, ‘DA Vinci Code’ is not long past. We of course have numerous plays, movies, novels facing the same. This sensitiveness itself is a direct indicator of potential of culture as well as high place held by historical/ mythical tales in the culture of the day. Epic films (we are largely discussing the Hollywood and its global consumption among the young, upwardly mobile and the target middle class) are like any other commodity in a consumer society accustomed to have a ‘more real than the real’ experience in consumption. Their production, ownership, consumption as well as narrative correspond thoroughly to a modern, capitalist period and its sensibilities. Any fluctuations, changes in the latter ought to have a bearing on the former. Thus Avatar couldn’t have been possible say, 40 years back. There lies the shift in epic films’ narratives with which I began. Epics function as a part of same above-mentioned culture and are not exempt from sensibilities and the demands of the immediate. At the same time, epics, with their location in popular culture over the ages, have the power of sanctification/ legitimisation of any immediate cultural/ political project- especially so in times of crisis where ’culture’ is argued to be the organizing links for social relations when economic structures are failing. The consumption of epic happens specific to the era one is living. So for some, it may well be a bygone age, distant from our present life; and some may seek to connect to the idiom, to the situations, the crises therein. In the process, what we achieve is '300 Ramayanas'- i.e. several shapes which speak much more about the people who wrote and rewrote the epics and their social conditions rather than myths and epics themselves. What then links this ‘culture’ of the myths and epics of the past with the modern, humble, quotidian times? Why they still remain popular, even, a necessary organizing principle of society for some? The answer is Utopia: utopia and its social functions. Perhaps, building utopia is the real binding process between ancient and present time, as it indicates the possibility of conceiving a stage of human life radically different from present one. And when one speaks of change in social relations, one cannot but help being thoroughly political. Clearly epics, like science fiction (or any work of art for that matter) are articulated with a certain political world view. It is naive to compartmentalize sci-fi as a ‘progressive and forward looking’ and epic as ‘regressive and reactionary’ as it completely misses the difference between time and history. We had abundant sci-fi serving the imperialism during cold war with diligence. Although epic-film can't be out rightly acquitted of charges of reactionary and regressive, we are increasingly seeing exceptions. And Exodus is such one to an extent with a different vision and takes on social relations. I wish to highlight the politics of the movie and which kind of utopia, it seeks to paint. A prophet salvaging his people formerly slaves and leading them to their holy land: which they have never seen, but which acts the ultimate unifier and key to their identity as 'people'. Thus goes the story. With a backdrop of the then most advanced and 'developed' economy like Egypt- with deep class division; playing on the resonance to drive home the points about present predicament is fairly well known route taken by the makers of Exodus. The discussion over the problems of slaves is a sharp indictment of a Malthusian logic to eliminate people to conserve resources and for development which has run into trouble since the financial crises of 2008. That fairly clarifies where the makers wish to stand. Debate over the role of ‘professional revolutionary’ has had a long history in Left-Anarchist debates. Exodus hints at it in a subtle way when one Hebrew faces Moses is questioning his authority over them after they have been freed. Similar concerns over shapes of political and social life post-revolution are hinted at intelligently with the realization that people can't always be on the run, in turmoil and a settlement requires nationhood. Prophets' role providing commandments is itself in question, though the movie doesn't spell it out in so many words. However, while the film goes the length in terms of its anarchist-liberal framework, the framework and film falters eventually in their utopian vision itself. Politics lies more in the unspoken. 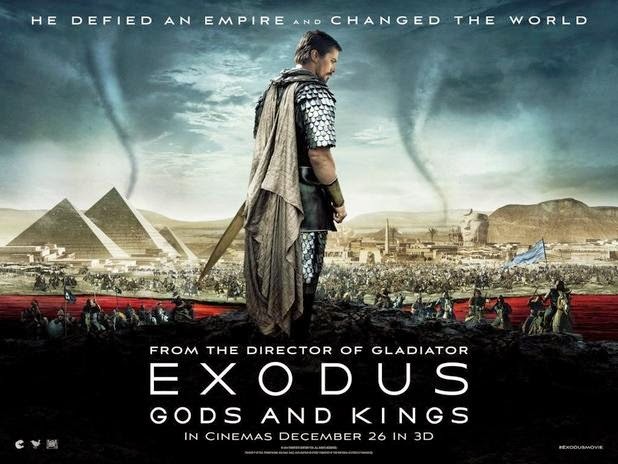 Epic film such as Exodus as a form for mass consumption best suits the bill. It begins with exotic locations of Egypt with royalty, slaves, and tribes of ancient time speaking a same language- modern English with all-white lead cast. It deploys modern rock music competing with sci-fi movies to produce a dual effect - a contemporary feeling (with complete modern beats) which seems to escape from itself in search of eternity and utopia. It's naive to expect a political subject-hood on the part of slaves akin to modern revolutions. But the radical changes which became myth, furthering the course of history, certainly had their people actively engaged. While attempting a modern take on the myths, it's necessary to situate 'people' in an active manner; not a passive lot which followed a Messiah sheepishly. Not that people don't act in sheepish manner, they certainly do. To that extent, the gap between ‘hero-villain’ vis-à-vis ‘chorus’ is unbridgeable at least in such endeavors. However, ancient epics were always attempting to bridge that gap between hero and chorus; chorus in Greek tragedies used to speak, have a voice of its own. A modern rendering of epics has reduced it to silent spectators, cogs in the machine - akin to the consumers of the artwork. What a good art does, though, is to point it, to name it- that is the limitation and a possibility of an art within the present. On this count, sadly Exodus, like plenty of other epic-films, falls short. Utopian vision on the screen ultimately seeks refuge in larger-than-life machines, a Messiah, a resurrection, a divine intervention, or even animation of screen character - freed from constraints of human society and its struggles - thereby confirming again its status as a commodity and location which is controlled by ruling ideas of the age. In the end, one is left wondering about the fate of modern Messiah and prophets (not the religious order, but intelligentsia) which has long been in search of its 'people'. From industrial proletariat to peasants, from first world to the third, from women, two tribes and even students; location of revolutionary agency as a search has had it all. In its desperation, it even sought refuge in identity politics. It didn't work. It brings us back where we began - the question of class, art and politics. While recognizing their linkage; there is a tendency to brush aside popular art as ‘lacking in quality’, or better, ‘ruling class propaganda’ (this one has ebbed in its popularity for a while, but certainly not extinguished). There is certainly some truth in that it is owned, managed by ruling class and its ideas - forming ‘common sense’ even for the artists. The class position of artists as intellectual working class (and a non-productive one strictly in the sense of ‘value’ elaborated by Marx) renders it more fertile to the reproduction of commercially viable narratives which already rule. But that is not it. We also need to steer clear of such complete and sweeping reductions such as ‘ruling class art as a sham’. Stalin’s warning against demarcating separate ‘proletarian’ language is imperative for art forms and broader culture as well. While drawing contours of a better world, we need to cognize efforts and directions provided by all quarters - willingly or unwillingly. Culture as a social relation stands subject to economic forces; nonetheless, as a social relation, only when aligned with politics; can it reshape those forces. As Christopher Caudwell had described the Western countries as a ‘dying culture’, the art forms of the day, which are attempting to cognize the present predicament of capitalism, are doing it with a vocabulary ill-equipped to provide any coherence. Nonetheless, the positive signs are worth acknowledging. In this regard, it is a characteristically similar predicament of Exodus. Moses found his people; we are yet to. And it shows in our narrative efforts - in words, on screen everywhere.